When it comes to going on a family vacation, if you read magazines and blogs, or watch the morning shows on tv before rushing off to work to sit in terrible traffic, it can seem like every other parent is the perfect packer and either has immaculately packed and organized bags with each child’s stuff labeled, perhaps even their underwear ironed or has kids that drop everything to help pack no matter what level they’re about to reach in the video game they’re playing with their best friend. Who are these perfect people with their unrealistic family vacation tips? I’m here to tell you that these people don’t exist or if they do, they don’t have real jobs and their children are actually robots they purchased on the internet. I’ve compiled these 7 realistic family vacation tips to keep you from going insane and from feeling guilty for not having a perfect life. Don’t Panic: So six months ago you and your partner or just you if you’re a single parent, decided it was about time for a family vacation and you booked it. Or maybe you’re reading this by accident and are now thinking it’s time for a vacation with the kids. Either way, you’re going on vacation this weekend. Whatever you do, remain calm; breathe. It’s going to be ok. Remember we already determined that there’s no wrong way to go on a family vacation or such a thing as a perfect family. You’ve got this. Research Activities In Advance: Ok now that you’re more relaxed, you have to do some planning. 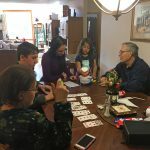 You don’t have to plan out every moment of your family’s trip, but it’s a good idea to have an idea of activities that your family might enjoy. that Pinetop-Lakeside, AZ has great fishing, so you’re renting a cabin on Rainbow Lake. gear, but maybe there are some local fishing events for kids while you’re there. advance, you’ll be better prepared when your kids tell you they’re bored. Don’t Leave Packing Until the Last Minute: There’s no need to sew labels into your kids’ and partner’s clothes or label plastic baggies with everyone’s name. You also don’t have to start packing the week before. The day or the night before is probably enough time. Make a list if making lists is your thing. If making a list stresses you out and makes you hate everybody who makes lists, yell at your kids, the dog, and/or random strangers, don’t make a list. If for some reason you are packing last minute. Remember tip number 1. Nobody is going to throw you in jail for stuffing balls of clothes into a suitcase five minutes before you leave. Give Teenagers Space: Seriously, don’t make them do everything with you. By all means, require them to spend a specific amount of time off their phones and with the family, but do not require them to go on every outing or participate in every activity, or to leave their devices at home. You’ll thank me for this advice. It’s not worth ruining your family vacation relaxing on a lake, or hiking in a gorgeous green forest by arguing with an adolescent. Pick your battles. You Don’t Have to Go to Disneyland, Disney World, Disney Paris, or Do Anything Disney: Don’t get me wrong, I love Disney and going to Disneyland. Disney is a fun place and a popular family vacation spot. But every family vacation doesn’t have to involve Disney or a theme park of any kind. You can just rent a cabin or go camping closer to home. If you live somewhere that gets really hot in the summer, like Phoenix, you can drive just a few hours north to the White Mountains and escape the heat. Plus there are lots of fun family things to do closer to home. Go On A Date: If you have older kids, you might not need a babysitter. If not, you could consider taking another adult relative with you or vacationing with friends and take turns babysitting so everybody can have some alone time without the kids. It’s not a crime to take a break from your kids when you’re all on vacation. And if you’re a single parent, you can still take yourself on a date. Go to a movie, or take yourself to dinner. It’s important that you get time to recharge so you don’t need a vacation from your vacation when you get home. It’s Okay To Do Separate Activities: Take my advice, you do not have to spend every minute together when you go on vacation as a family. Your kids might not want to tag along while you look at antiques. Or maybe you’d rather ski down the advanced slope than being stuck on the bunny hill while your younger kids learn to ski. If there’s a day camp or children’s all day supervised activity where you’re going, you don’t have to feel guilty for enrolling your child and then going off to do your own thing for the day. Your kids need their freedom and will have lots of stories and crafts to share with you that will go far to creating happier memories than if you drag them along everywhere and they whine and complain for the entire trip. So there you have it, my tips for not going nuts the next time you go on vacation with your family. If you follow my advice, I think your vacation will be a lot more relaxed and your family will have a much better time than if you’re stressed and worried about being organized. I have one last tip, my bonus gift to you, the only thing on the list you really need is to remember number 1. Don’t Panic. Because that way no matter what happens, you’ll remember you can buy anything you forgot at home and you can ignore even the snarkiest teenager. Have fun on your vacation and if you’re looking for information on the perfect place to take your family fishing, or an ideal base for next winter’s family ski trip, fill out our contact form below.